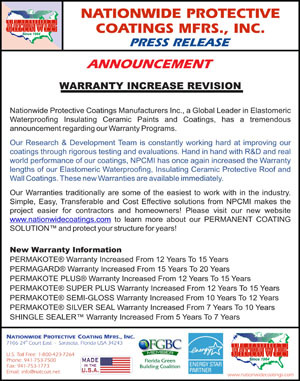 Increasing Warranty Announcement | Nationwide Protective Coating Mfrs. NATIONWIDE PROTECTIVE COATINGS MFRS., INC.
Nationwide Protective Coatings Manufacturers Inc., a Global Leader in Elastomeric Waterproofing Insulating Ceramic Paints and Coatings, has a tremendous announcement regarding our Warranty Programs. Our Research & Development Team is constantly working hard at improving our coatings through rigorous testing and evaluations. Hand in hand with R&D and real world performance of our coatings, NPCMI has once again increased the Warranty lengths of our Elastomeric Waterproofing, Insulating Ceramic Protective Roof and Wall Coatings. These new Warranties are available immediately. Our Warranties traditionally are some of the easiest to work with in the industry. Simple, Easy, Transferable and Cost Effective solutions from NPCMI makes the project easier for contractors and homeowners! Please visit our new website www.nationwidecoatings.com to learn more about our PERMANENT COATING SOLUTION™ and protect your structure for years!